People always think I’m this brave little human with no fear and balls of steel. I am here to tell you that is not true. I have the same fears as everyone else. I get scared of closed in spaces, tight clothes, hot environments, heights, water and meeting people. The difference between me and all those other people with the same fears is that I take that tight feeling inside my chest, I blink back those tears, take a deep breath and I say “okay bye,” and push forth into the void before I have a chance to change my mind. My closest friend once told me it takes 10 seconds to become afraid of talking to someone, so to become more socially interactive, as soon as he saw someone he wanted to talk to, he started counting. Before he reached 10 he would already be making his way to start a conversation. I found this piece of advice super helpful and began to explore how long it takes for me to start getting anxiety. It turns out I have about 3 seconds. This means every time I get up to speak in front of an audience, every time I get spooked on a climb, every time someone says “who’s first?” I know that within 3 seconds I better do something or else loose the cahones. 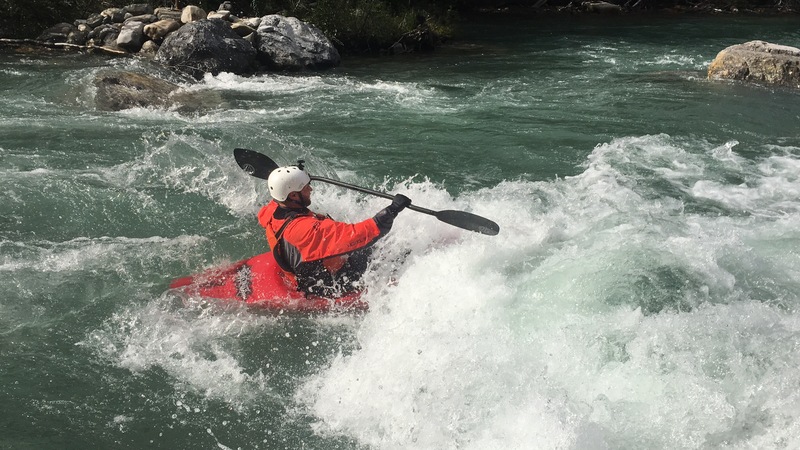 As many of you are aware, I’ve recently begun white water kayaking. It’s not something I ever thought I would do, due to the fear of drowning. Even though I’ve been a lifeguard for over 15 years and participate in most water sports, it has taught me to have a healthy respect for water. Then 4 years ago I saw the Reel Rock film tour in Fort McMurray. It changed everything. I have always loved waterfalls and water related things. 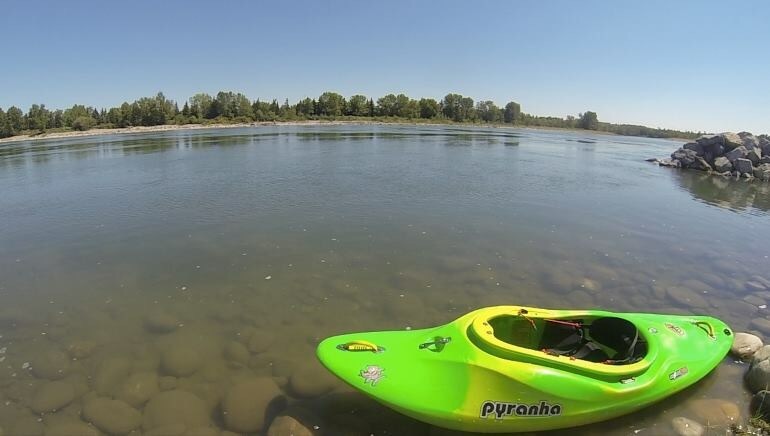 Pretty much all water activities I love. However, I did not know how enchanted I would be until I saw the paddling film. Paddlers hiking in South America and dropping huge waterfalls. 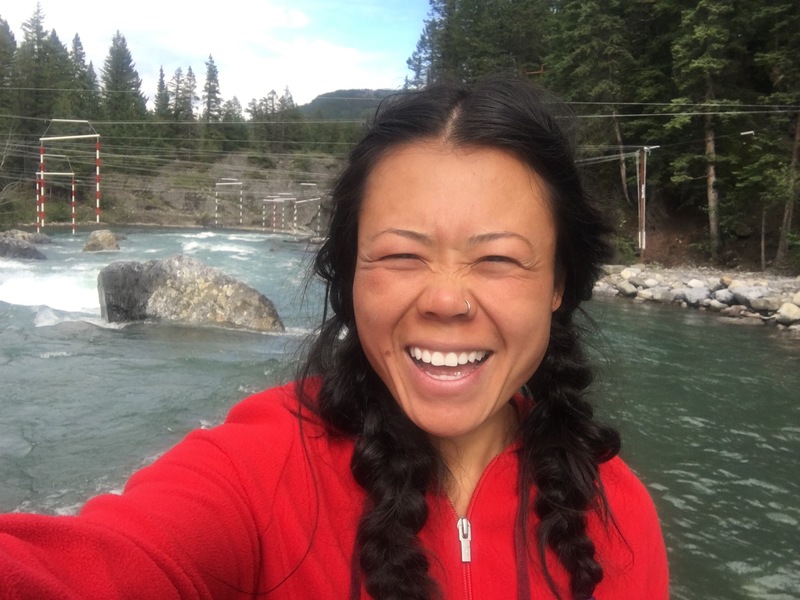 Charging wild white water rapids and rolling in, out, through and around them. I was enthralled. I left that theatre feeling a passion for something I knew was an all too familiar feeling. Love. I was in love. The following spring Adam and I searched online for used white water boats. At the time I had no clue what the difference was between styles of boats and we just bought whatever was affordable and fit our bodies. We learned later, that we bought the hardest boats to learn on – play boats. These are meant to be super sensitive and responsive for performing tricks and acrobatic stunts, not for beginners. Initially, we spent a couple hours, a few times a week trying to learn how to roll. It took us almost two weeks and 10 hours of practice before we were successful. 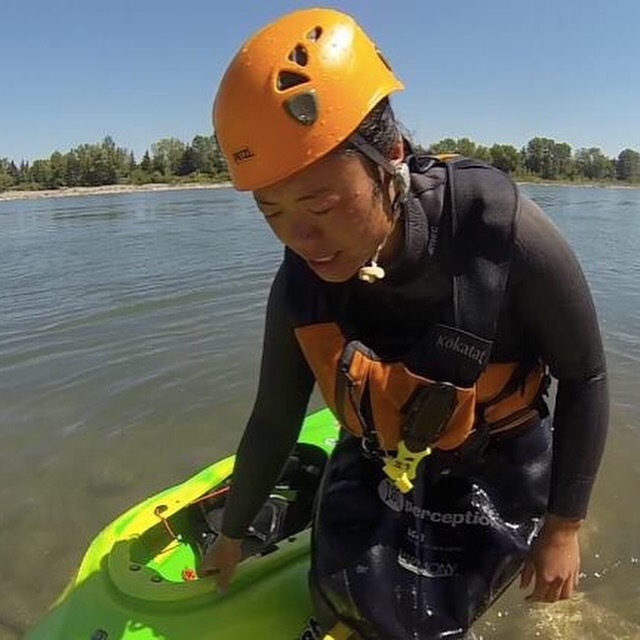 We watched YouTube videos and read about technique and paddle theory. 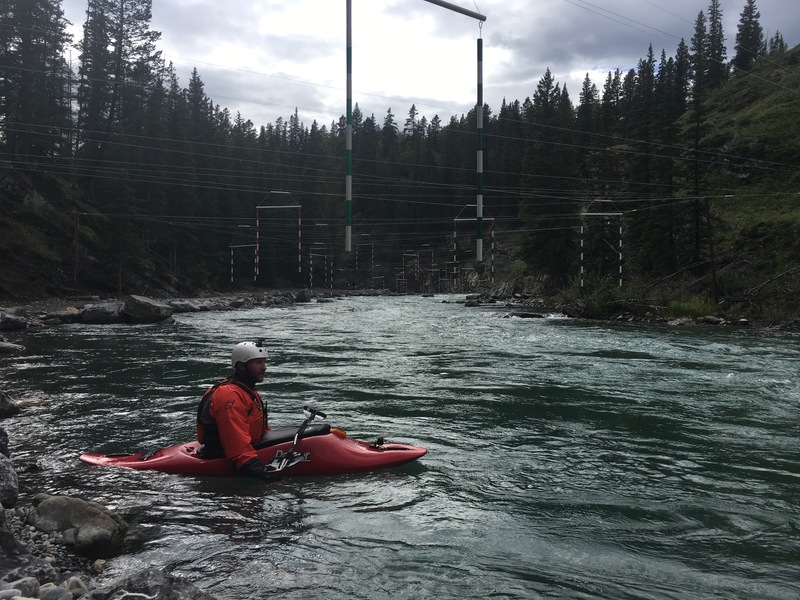 Later that summer we made a trip to Colorado and spent a day wth a guide paddling through white water and learning some very important skills. We had an amazing time! 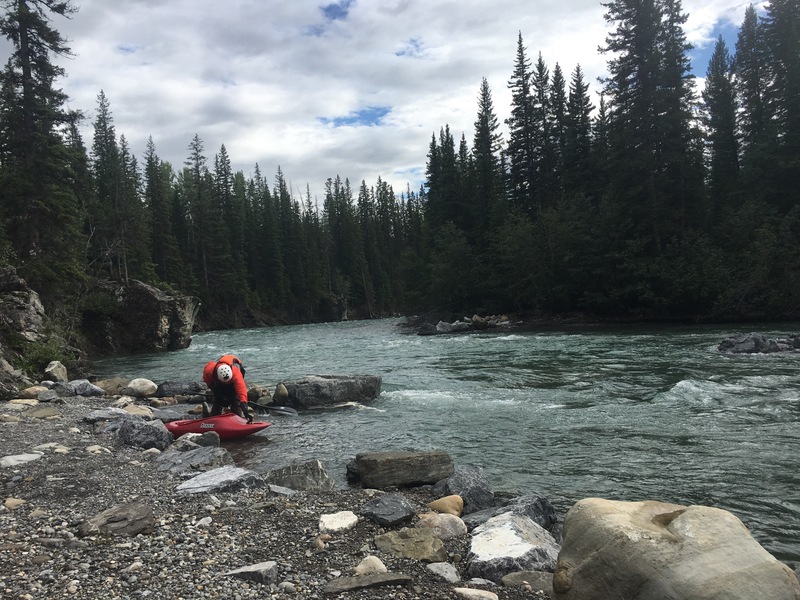 Then only one more time in Ghost River with a guide from Undercurrents. That was the last time we paddled in 2013. In 2014 my retina detached and we avoided paddling altogether. Fast forward to nearly 3 years later. 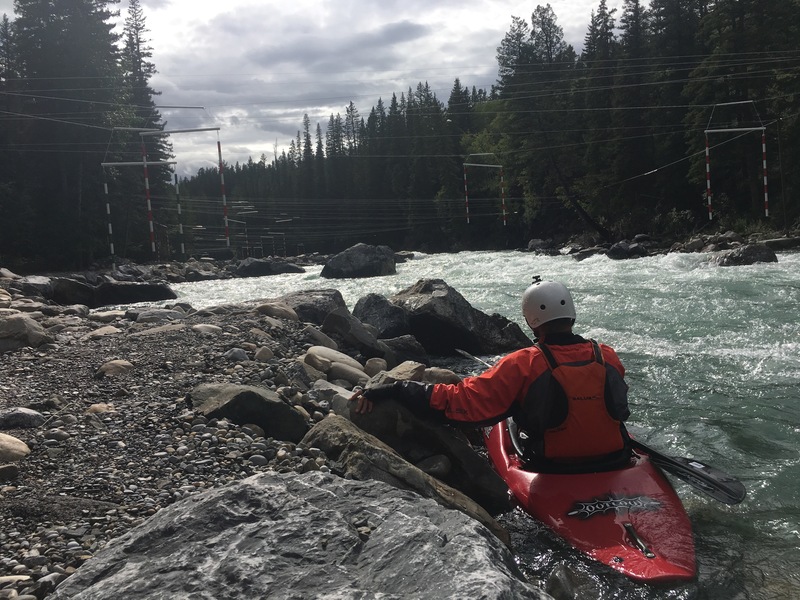 Last summer, 2015, was a write off for improving our white water skills as we accepted a dream job representing Woods Canada as brand ambassadors. Though we paddled a lot it was mostly canoeing and on flat water. Except for one roll, I performed in a sea kayak using a Greenland paddle we made ourselves, I had not practiced any white water skills. 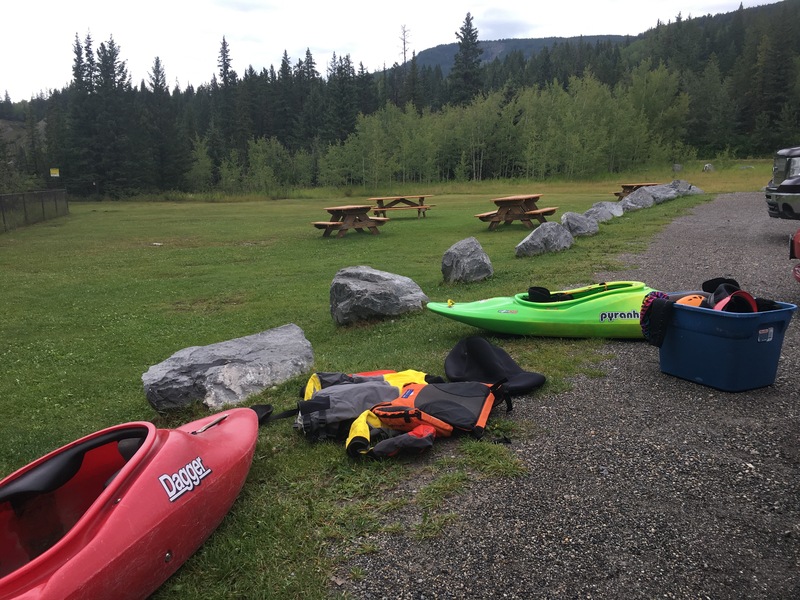 Now we’re trying to get reacquainted, to be honest this season Adam and I nearly decided that maybe white water kayaking was not for us and maybe it was time to give it up. We had been away for it for so long, it had become scary, intimidating, and impossible. Then we started river surfing and next thing you know we met Peter. 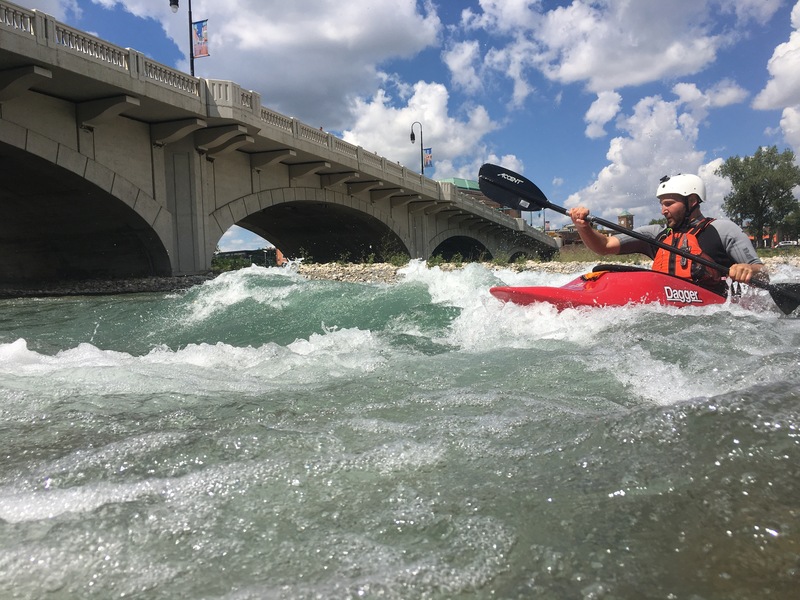 He happened to be kayaking past the 10 St wave in downtown Calgary and Adam became quick friends with Peter. Now it’s been a week and a half with 4 days in the water and about 20 hours total. I’m in love again. The fear is still there, but it’s now manageable and I’ve improved my skills enough that now I can mitigate the risks. I’m rolling consistently again and I’ve even learned a new roll. I’ve learned to reduce the chances of flipping over and even if I do it’s not a big deal because I can flip back. I’ve hit my head and thanks to my helmet it’s done and over with. This was one of my major fears and once it happened, I realized I can deal with it. What I’m trying to say is, I’ve been there. I’ve been afraid to try things like any one else. I’ve even tried things and been brought to the brink of quitting due to my fears. The longer we let our fears fester, the more uncertain we become and the fear manifests into something bigger than is real. If you want to be brave, know that it is okay to be afraid. Find out how long it takes for you to lose your nerve. Is it 10 seconds? 7 or 5? Just remember that those that are bravest, are the ones that count and just go for it. 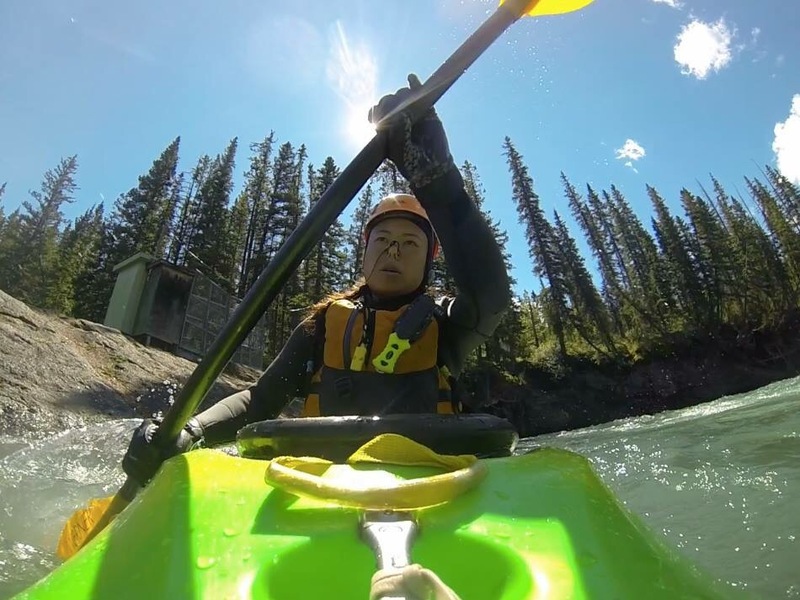 This entry was posted in Adventure stuff, alberta, Inspirational, paddling, Popular and tagged inspirational stories, kananaskis river, white water kayaking, you can do it by melbaseto. Bookmark the permalink.